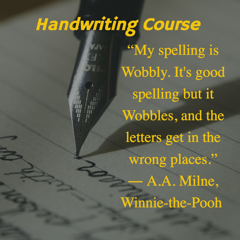 5 structured handwriting lessons – designed to improve quality of writing. Each 30 minute lesson will start with an activity to designed to develop hand- to- eye co-ordination, form constancy, spatial organization or orientation. This is followed by a individually tailored writing task to help the student improve their cursive writing fluency. Please call or email Sue to book times which suit you.